Contrary to their name, banana slugs don't eat bananas -- unless they come across a rotting banana tossed alongside a camper. Banana slugs get their name by from their elongated yellow bodies. They live mostly in the Pacific northwest. Some turn brown, black or green, but most stay yellow to mimic decomposing leaves. They are one of nature's recycle bins, eating decaying plants and animal waste and turning them into fertilizer for surrounding plants. A staple of banana slugs is dead plant materials such as fallen leaves, pine needles or grasses. But one of their favorite foods is mushrooms or other fungi, usually found on the forest floor and at the base of tree trunks. When live plants are readily available, the slugs might munch on plants such as grass or a tree seedling with easy-to-access leaves. 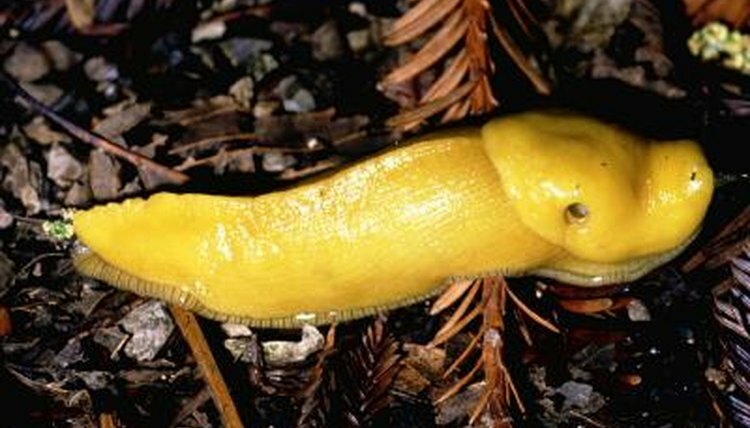 A banana slug's diet is similar to that of most other slug species. Many other slug species, such as the garden slug and the field slug, prefer live plants, although they'll eat dead and dying plants as well. These slugs can be a major problem in your garden, snacking on new seedlings as the fresh leaves poke through the soil. If they crawl through some animal poo, banana slugs are likely to stop for a quick meal. Animal feces often contains plant matter that the animal's body considered waste. To slugs, however, it's more like a buffet. They don't typically seek out animal feces, but banana slugs won't turn it down if it's readily available. Although their diet sounds simple and available at any time, banana slugs are most likely to come out at night to grab a bite. Like other slugs, their bodies are covered with a film of mucus that helps keep their bodies from drying out. During the heat of the day, the mucus isn't always sufficient to keep the slugs from dessication. When it's hot and bright, banana slugs are more likely to burrow under some fallen leaves and rest, waiting for cooler, damper weather to graze for food. In deeply shaded areas, especially those near streams or rivers, the slugs might feed at will, regardless of the time of day. Banana slugs serve a valuable purpose in a forest ecology. When they eat detritus, or decomposing matter, their bodies process it in such a way that the slugs' excretions become a nutrient-rich fertilizer. Although decaying plant matter and animal feces eventually break down and release nutrients into the soil, slugs hasten the process. This helps keep the soil rich, which feeds existing trees as well as germinating seeds. Are Slugs Poisonous to Humans? What Does a Katydid Need to Live? What Do Leaf Beetles Eat?